Early this month we talked about how traumatic injuries in children have a tendency to double over the summer months. In that blog, we outlined some of the more common injuries that happen and how you can help limit risk. However, kids aren’t the only ones cooped up all winter, and they aren’t the only ones to see an increase in traumatic injuries. Falls and accidents leading to traumatic injuries in adults also increase 25-30% during the summer. Lawn Mower Accidents affect way more adults than kids. Which is good: when a child is involved in a lawnmower accident, they often need surgery. An adult has much better outcomes. However, while only a handful of kids are involved in lawn mower accidents, across Canada and the states, a couple hundred thousand adults will get injured. The best ways to protect yourself are to remove rocks and sticks from your lawn, to never try to fix a jammed mower while it’s connected to a power source, and to keep kids and pets out of the way. Drowning. Adults and teens rarely drown at the pool. Often they’re tall enough that they can just stand up if they ever feel distressed. However, drowning in natural bodies of water like lakes are all too common. Often these accidents occur after falling off of a boat, seadoo, or while performing water sports. To prevent drowning and near-drowning incidents, it’s important to go out on the water with at least one friend, to wear life jackets, and to remain sober while in or on the water. Barbecue season is pretty much universally enjoyed. There’s nothing quite like the sizzle of steak on the barbecue. Unfortunately, the barbecue might just be the most dangerous household item after the bathtub. Burns and carbon monoxide poisoning are two of the problems adults may run into when operating a barbecue. 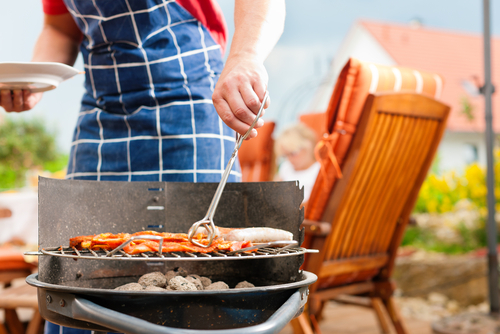 In order to avoid these dangers, never keep your propane tank at more than half a turn from off, only barbecue in open, outdoor spaces, and be careful when flipping, lighting, or otherwise interacting with the hot grill or flame. There are many ways that Canadians get hurt over the summer. Sports injuries from basketball, football, soccer, and even golf are common. Driving collisions increase during the summer as well. Sunburns and insect bites by themselves are fairly benign but can lead to skin cancer or a pathogen such as west nile. Adults walking around barefoot or in flimsy sandals are at risk for injury from poison ivy or cacti or nails. Like we said, there are just a ton of ways to get hurt. Fortunately, most risks can be evaded with a little bit of planning and common sense, and if things do go wrong, Health Risk will be here to help.